Join author Art Singer at Suffolk University's Modern Theatre as he takes you on a fascinating journey into Boston’s film and movie house past. Presented in collaboration with Suffolk University and the Boston Preservation Alliance, "Boston’s Downtown Movie Palaces" offers a chronological history of Boston’s theaters and their evolution in the city. 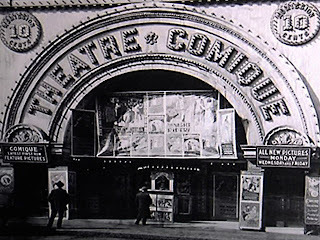 Through rare images and fascinating stories, Mr. Singer will discuss the historic role of the Modern Theatre and its owner Jacob Lourie, as well as the five Movie Palaces included in his book of the same name and how several Boston theaters were saved and restored. The program will be followed by an interactive audience discussion and book signing with Mr. Singer. This event is free for members of the Boston Preservation Alliance and the Suffolk University community. Non-members may purchase tickets for $10. For more information and to purchase tickets, please click here. For more information, please email admin@bostonpreservation.org or call 617.367.2458.